One of my co-workers has a gluten intolerance. I always feel bad because there are a high amount of goodies that float through work – whether it be cookies, brownies, cakes, muffins, or other forms of baked goods. If she wanted to eat them or not, she can’t because she knows the repercussions she would be responsible for. So what did I try? Baking gluten free brownies! They actually aren’t that bad. I found the recipe here on the Trader Joe’s website. I love that store, can buy so many things there that are on the healthier side. I made the mistake of adding everything into the same bowl and trying to mix it with a mixer. Wrong choice. The black beans didn’t get ground up quite as well as I wanted it to. I didn’t have a food processor handy, so instead I used an old fashioned blender! It worked great, and everything was mixed to a nice consistency. The next step would be to grease the pan with canola oil. I just put a tablespoon onto the pan and then rubbed it around with a paper towel. You could get fancy and spray a non-stick spray onto it, but I don’t like aerosol, and I’m klassy with a Capitol K, so I just stick with the simple stuff. The whole time I’m mixing, I have the oven preheating to 350 degrees. After greasing the pan and making a hot mess of myself, I pour the batter from the blender into the pan (from my experience, the blender tends to make less of a mess when the lid is actually on. Not going to admit if I was the one that did that or not). Pop it into the oven for 30-45 minutes and voila! You have your gluten free brownies! Regarding the texture and flavor – it’s not that bad. 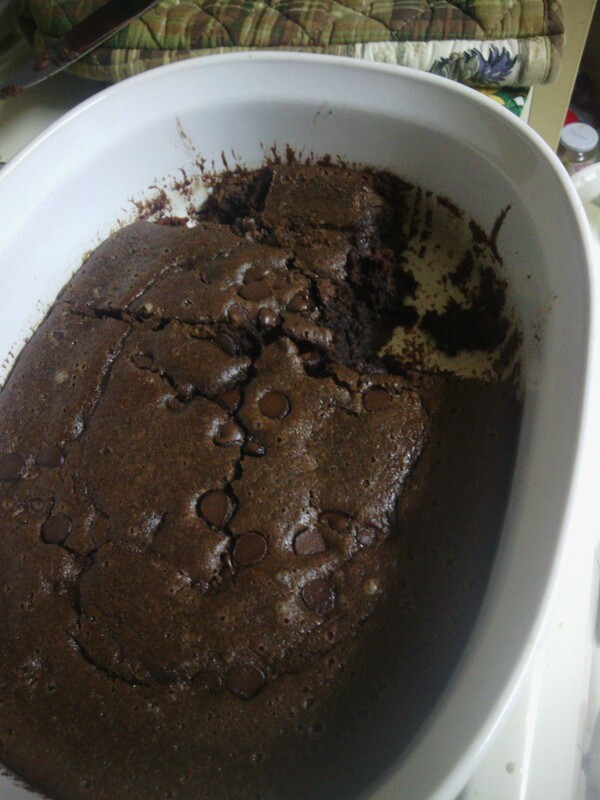 It has a slight bean after taste, but it’s rich and moist. It tastes nearly like a regular brownie, but you can tell it has more protein in it. Try it at home with your own variation! Let us know how it goes! This entry was posted in Cooking and tagged baking, canola oil, cooking, flax seed, natural living.